Stonehenge Aqua. 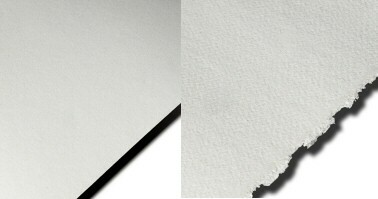 A finely crafted watercolour paper. 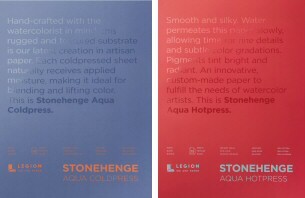 Stonehenge Aqua is a finely crafted paper that is also affordable. It is 100% cotton, 300gsm or 600gsm, pH-neutral, acid-free, lignin-free, chlorine-free, and contains no optical brightening agents. Stonehenge Aqua accepts multiple layers of colour in a controllable manner and watercolors can be easily manipulated without drying out. Blending is effortless, lifting is no longer a chore, and it welcomes masking. It is also a paper that starts flat and dries flat. It is available in Blocks (15 sheets), Half Sheets and Full Sheets in 300gsm and 600gsm. Each Block contains 15 Sheets. Full sheets are 56x76cm with two deckled edges. Half sheets are 56x38cm with two deckled edges. Measurements may vary slightly due to the deckled edges of the paper. Large sheets are denoted with an L. There is a 5 sheet minimum for the large sheets. You can mix any colours or brands to reach the five sheet minimum.